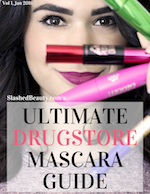 It’s not every day when you find a truly innovative product on beauty shelves. Maybe you’ll find unique packaging or applicators, but makeup formulas themselves don’t get changed up very often. So when I walked by the L’Oreal Infallible Magic Pigments at Ulta Beauty, I literally did a double take because I was so confused and intrigued. 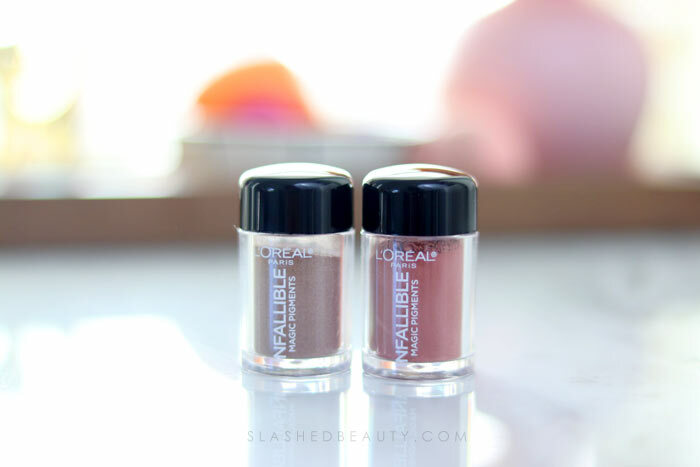 The L’Oreal Infallible Magic Pigments for Eyes and Lips are loose powder pigments that blend out into a cream formula. There is a line for the eyes and for the lips, which cannot be used interchangeably. 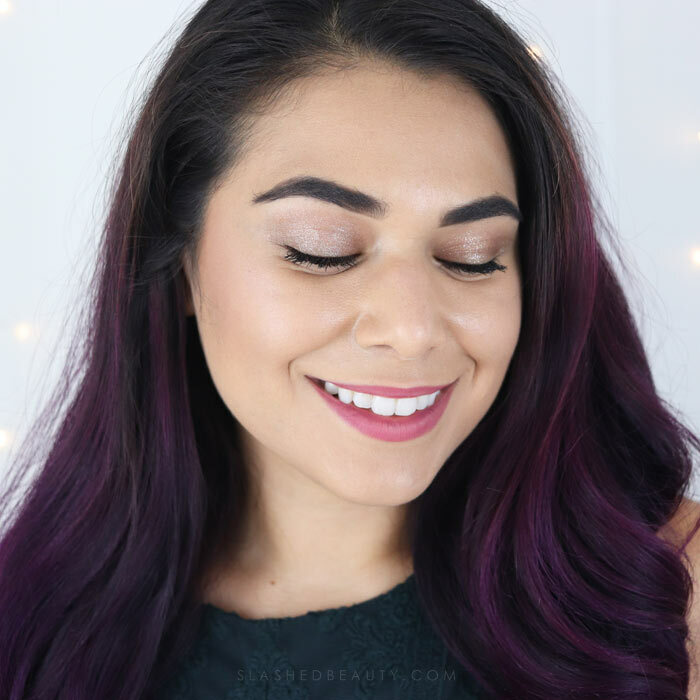 The powder starts out incredibly soft and fine, but as you blend it into your skin it transforms into a creamy buildable color all on its own, no need for mix-ins. You can use both your fingers or brushes to apply the product. Something to note: Ulta Beauty is the only place selling these as far as I know, but their site has the Eyes and Lip shades mixed up. The eye shades are listed on the Lip page and the lip shades are listed on the Eye page. Hope they fix this soon, because different ingredients in the formulas are not safe for the other part of the face. The packaging of this product took me by surprise. 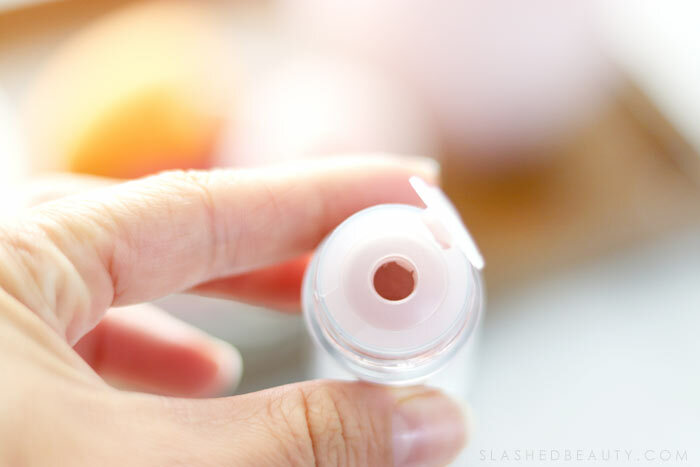 Instead of a sifter, which you would typically expect with a loose powder product, you only have a flip-up stopper under the jar’s lid, covering a hole that leads straight to the powder. I am not a fan of this, as it gives very little control of how much product you’re dispensing. However, I understand why a traditional sifter wouldn’t work because of the transforming properties of the formula— you wouldn’t want to mix the powder with the product that had already turned creamy. I picked up one shade from each line: Retro for the eyes and Instant Crush for the lips. Retro is a taupe shade packed with silver shimmer. I love these kinds of colors for all-over lid shadows, which is what I typically do when using cream eyeshadow. It’s a good one-step look that still adds dimension. Even though the formula blends out into a cream, the cream actually dries down and sets very quickly— so you must blend out as fast as you can before it’s too late! I found it easier to apply with a brush, specifically my Sigma Wide Shader E59 brush which is dense, but slightly fluffy at the tips to help pack on color and blend (Use code SlashedBeauty for 10% off!). Instant Crush looked like a dusty mauve shade when just looking at the powder in the jar. 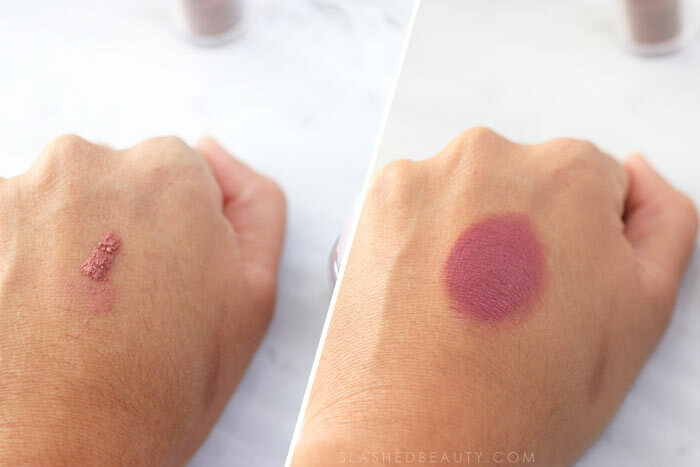 However, once I started blending out the powder, the shade deepened into almost a berry shade. It’s still pretty, just not what I expected. I wonder if the other lip shades also apply darker than they appear! The finish on this is a velvety matte but the fact that it’s creamy as you apply prevents your lips from feeling dry. The Magic Pigment feels super lightweight and you can barely feel it if you rub your lips together. Watch the video at the top of the page to see the application process in action. The questions I had before testing these out were: how practical are they? What’s the draw of adding these to my collection besides novelty? 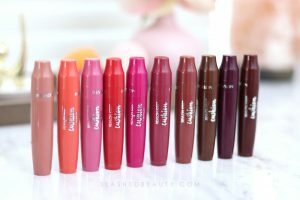 They’re definitely different and fun, but are they something I want to be messing with for an every day routine? For the lips, I don’t really see myself wanting to use this product over my traditional lipsticks. The color didn’t end up lasting very long, and it’s just a bit of work for an average appearance. However, for the eyes, I can actually see a draw for this type of formula. 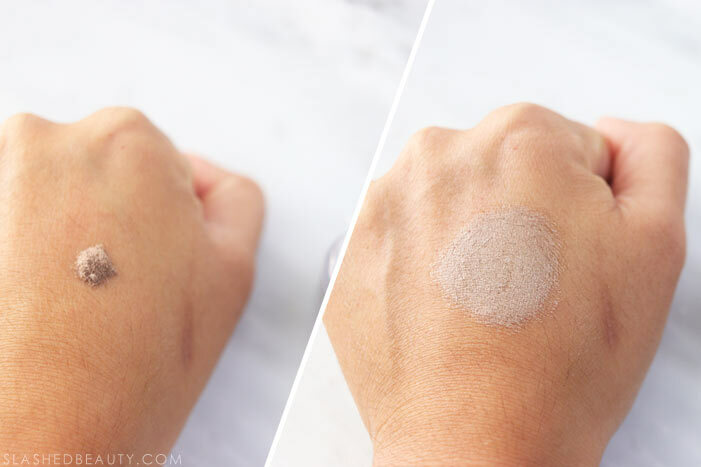 Cream eyeshadows “expire” much quicker than powder eyeshadows, because for one, many people use their fingers to apply them (including myself) and two, the wetness in the formula makes them prone to bacteria growing when contaminated… something that’s easy to do if you’re dunking your finger in a jar repeatedly to apply. Having this start out and being stored as a powder formula means that it can last longer than a typical cream shadow. Even if you want to use your fingers, you would pour some out before blending so there’s less room for contamination as well. 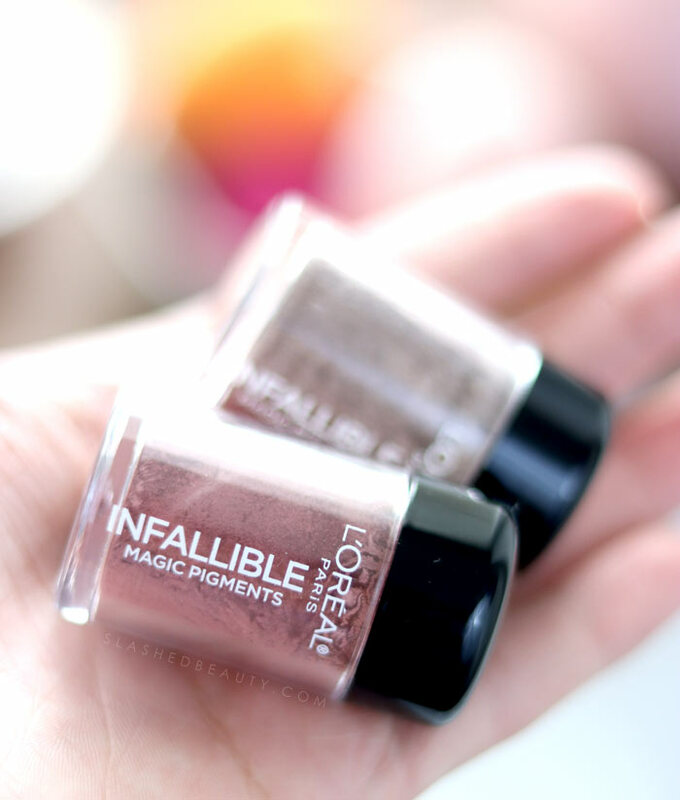 The L’Oreal Infallible Magic Pigments for Eyes and Lips are a tiny bit pricey at $14.99 each, but are a fun addition to your makeup collection for something different. What do you think of these powder-to-cream products? Did you ever figure out a way to use these without the powder making a huge mess? They were on clearance for $2.99 at Ulta. I bought lots so I could try them out. I love the actual powder to cream and it wears well on me. But I’m about to throw them away because my sink looks like a powder rainbow explosion. If it gets wet…creamy mess. Not really, the best method I figured was to tap into the cap first and then pick up from there. But yeah they’re definitely a bit of a hassle. Very cool product but messssssy!